SCVHistory.com LW3292 | Melody Ranch | Monogram's Rough Riders in 'Below the Border.' Lobby Card, 1942. 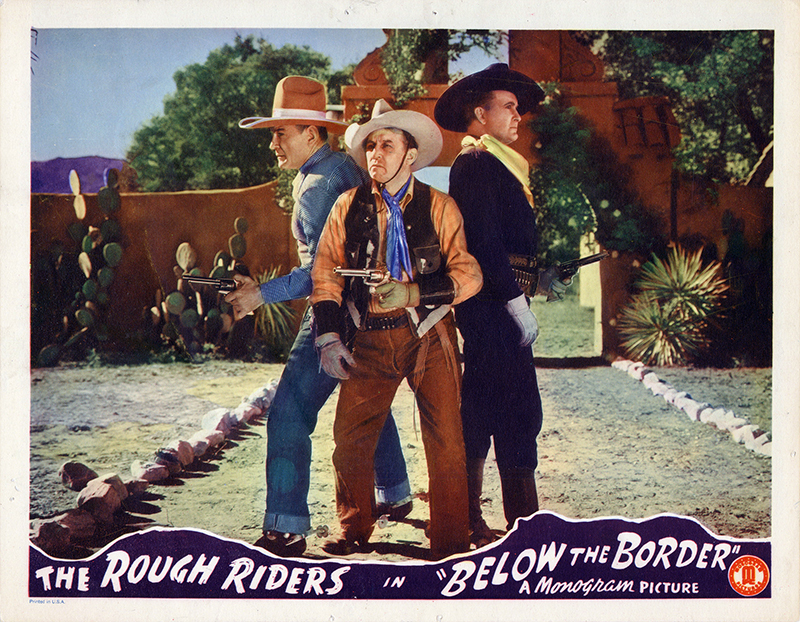 Rough Riders in "Below the Border"
Monogram's Rough Riders — from left: Buck Jones, Raymond Hatton, Tim McCoy — at the main entrance to Ernie Hickson's Monogram Ranch in Placerita Canyon to promote 1942's "Below the Border." Like all lobby cards of the era, it's a colorized version of a black-and-white photo which, in this instance, was also used on this arcade card. Hickson's movie ranch in Placerita Canyon was renamed Melody Ranch after Gene Autry bought it a decade later. In the 1940s, when the box-office appeal of the big stars of the 1920s and 1930s such as Hoot Gibson and Buck Jones began to fade as their original audiences aged and outgrew them, Monogram producer Scott Dunlap teamed them up in dozens of in low-budget ("B" Western) "buddy pictures" in an attempt to triple the attraction. This is one such film. Produced by Dunlap with set design by Hickson, cinematography by Harry Neumann and stunt work by Kermit Maynard, Fox O'Callahan and Wally West, "Below the Border" also features Linda Brent, Dennis Moore, Charles King, Eva Puig, Roy Barcroft and Bud Osborne. Uncredited cast includes Jones' horse Silver, Chris Allen, Jack Daley, Frank Ellis, Chick Hannan, Reed Howes, Howard Masters, Merrill McCormick, Bill Nestell, Tex Palmer and Jack Rockwell. LW3292: 9600 dpi jpeg from original lobby card purchased 2018 by Leon Worden.